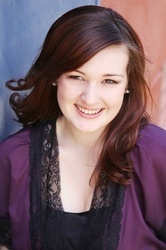 Katelyn is a voice actor and ADR scriptwriter for Sentai Filmworks. New to the industry but no stranger as a longtime con-goer and anime fan, Katelyn is best known for writing the English dub script for the hit anime series Akame ga Kill!, which premiered on Cartoon Network's Toonami block in August 2015. Katelyn's voice can be heard as several anime characters, such as Ena Kisaki in Magical Warfare, Misty and Young Art in Hamatora: The Animation, Chie and Kanade in Brynhildr in the Darkness, Kayono Sakura in Super Sonico, Chacha in Nobunaga the Fool, Liliana in Log Horizon, and Shimako Kai in Muv-Luv Alternative: Total Eclipse, to name a few. Other scriptwriting credits include Love Chunibyo & Other Delusions -Heartthrob- as well as some super-top-secret cool stuff that's sure to be announced before the con!